The Most Complete Balance in It's Class! The ideal partner for diving centers and diving shops, who expect reliable and long-life use coupled with low operating expenses. Rapid spare parts supply and service guarantee a successful diving season - worldwide. The patented P41 purification system guarantees purest breathing air quality acc. to DIN EN 12021. Easy Access, Frameless Draughtshield with Removable Doors - All doors, including the front and back glass panels, disassemble in seconds, and together with a stainless steel base, make it fast and easy to clean. SmarText Software Guides Users Through Balance Use - SmarText is Ohaus' easy to use balance software that utilises text prompts to guide users through applications and balance setup. QuadraStance Design Provides Superior Footprint Stability - To enhance weighing stability, QuadraStance incorporates four feet to provide superior footprint stability on any surface. Flexibility of Available Options - Ensure weighing accuracy with InCal internal calibration. A factory installed USB or second RS232 interface allows connection to multiple peripherals. 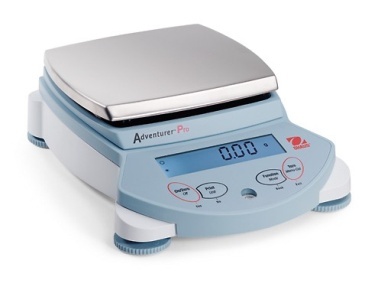 Users frustrated by navigating tight spaces will welcome the easy-access weighing chamber of the Adventurer Pro. The draughtshield is designed without the need of top rails, so users have unobstructed entry to place or retrieve materials to be weighed. With such unostructed entry, the chance for accidental spillage is reduced helping to eliminate waste. With contamination being a concern in today's work environment, all doors, including the front and back glass panels are simple to remove and replace for fast and easy cleaning. Should breakage occur, within 3 easy steps, each replacement door and panel can be installed in seconds. SmarText is Ohaus' easy to use balance software that utilises text prompts to guide users through applications use and balance setup. Delivered through a 2-line backlit LCD and clearly marked buttons, SmarText tells you what is going on and what you have to do next. Utilising the 2-line LCD, SmarText simultaneously displays weight and application specific information such as percent or count. For example, with one touch of the Function button, SmarText will display application reference information such as average piece weight (APW), while displaying a parts count. QuadraStance incorporates four adjusting feet to provide superior footprint stability on any surface. QuadraStance helps prevent rocking and tipping, enhancing the weighing stability of the balance, and keeping the Adventurer Pro level and accurate. Additionally, Adventurer P ro has been designed with a front level indicator eliminating the need to look behind the balance during the leveling process. A quick glance at the level indicator helps to ensure that the balance is level prior to each use. The Adventurer Pro also offers InCal internal calibration. InCal ensures weighing accuracy by allowing you to calibrate the balance prior to use without the need of external weights. All Adventurer Pro models come with a built-in RS-232 interface, and for added functionality can be equipped with either a second RS-232 or USB interface, allowing connections to multiple peripherals. With full GLP/GMP data output, Adventurer Pro can meet traceability and compliance requirements. Models in this range include the AV213C, AV313C, AV413C, AV212C, AV412C, AV812C, AV2102C, AV3102C, AV4102C, AV2101C, AV4101C, AV8101C, AV213, AV313, AV413, AV212, AV412, AV812, AV2102, AV3102, AV4102, AV2101, AV4101, AV8101, AV212DM, AV412DM, AV812M, AV2101DM, AV4101DM, AV8101M, AV413CM, AV212CDM, AV412CDM, AV812CM, AV2102CM, AV4102CM, AV2101CDM, AV4101DM and AV8101CM.